As we approach the one year anniversary of the 500-year flood that has forever changed the lives and landscapes of Texas, we at LSF thought it might be a good time to share some thoughts and reflections on recovery. It is my privilege to work as a Team Leader for our Lone Survivor Retreats and I am honored to be able to share these thoughts with you. The day Hurricane Harvey arrived was the first day of my maternity leave. My view of the epic flood was a little different than so many of those I know and love. 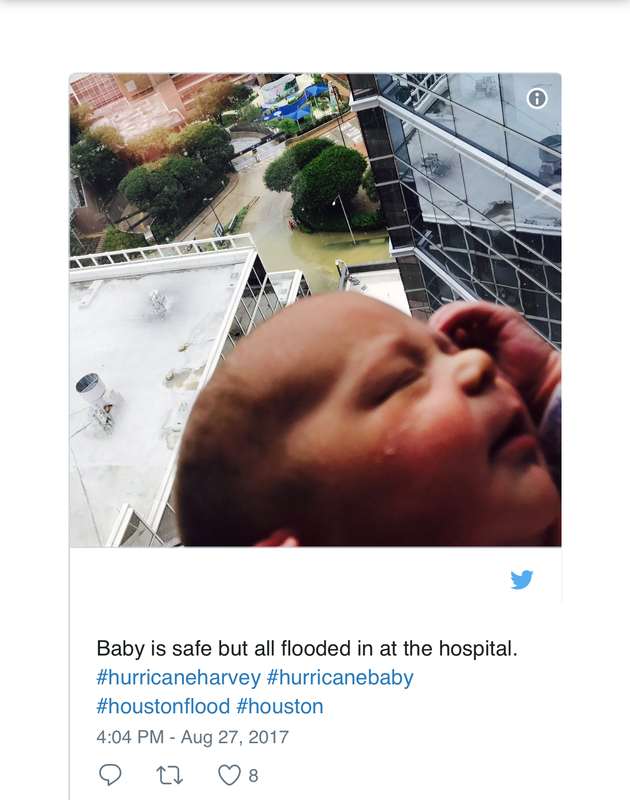 For six days my husband, our newborn daughter and I were flooded inside our downtown hospital. This drastically changed our vantage point of the event. From the 12th floor, we watched as the submarine doors were shut and the water rose. I laid in the hospital bed holding our precious baby and watching water rescues on the news. It was eerie and surreal. Seeing the story of the Coast Guard helicopter transporting a woman in labor who couldn’t get to the hospital brought both tears of sadness and relief. Who would have thought that a breech baby and an unplanned C-section could very well have been the blessing that saved both of our lives? It could have very easily been me in the helicopter. But then the stories started to get personal…video from friends trapped on the second story of their home with the water still rising…families from our church small group being evacuated with their small children by canoe…being unable to physically reach our son and praying the water would not violate the doors of our home too…and the list goes on. The hospital was strangely quiet. No new staff or patients were coming or going. The only noise was the sound of newborns and the news. It was there that I sat and reflected on what it truly means to feel helpless and powerless. While we felt those things safely from the 12th floor, others were feeling those things in extreme danger and our hearts broke for them. The experience of trauma comes disguised in so many packages, all of which can be accompanied by a pervading sense of helplessness and being powerless to change it. While the term “post-traumatic stress” is often synonymous with military combat, it can also come into our lives through a car accident, a relational betrayal, abuse, and, yes, even a Hurricane. It can be experienced directly like our friends that we prayed for, and it can also happen vicariously to those who witness others in life-threatening danger. The symptoms can start gradually or they can hit like a ton of bricks dropped off a cliff from an Acme cartoon. So what do we do? Often our natural tendency and reaction is to avoid. As people, we spend a lot of time, energy and money avoiding pain. And sometimes the things we avoid will eventually stop bothering us. But, more often than not, the things we do our best to avoid just grow. In the rebuilding phase post-Harvey, all of the homes breached by flood water had to be taken down to the studs. The risk that mold would grow like an insidious toxin hiding inside the walls was too great. Millions of Texans have had to tear it all out and start again. For many, the shell of their home was left in-tact. By the time the water receded it was often hard to tell from the road that a home was gutted inside. Sometimes the only clue was the debris still sitting at the curb-which for some people is still sitting there even a year later as a poignant reminder that recovery is a slow process that takes time. Our emotional house is not all that different. We call post-traumatic stress an invisible illness because from the outside the house may look in-tact but inside may be a very different story. Here at this one year anniversary, I believe we are all in different phases of Hurricane Harvey recovery. Some homes are restored and a sense of normalcy has returned. Others continue renovation and are experiencing all of the challenges that come along with construction. And there are those still displaced and just trying to make it every day in the survival mode that comes after a trauma. So my question is, how’s your house? No matter the stage of your recovery there is hope. Maybe you’ve done all the physical work of rebuilding and now that your sense of home and safety have been restored its time to turn your attention to the emotional house. The repair and remodeling of the emotional house is just as important as the physical house. Left unattended the neglect of the emotional house after a trauma is akin to letting mold grow inside the walls. It might be invisible but the effects can be deadly. The truth is that it’s OK to not be OK…but it’s not OK to stay that way. Coming to acceptance that trauma-whatever the source-has changed us is both sobering and hopeful. The good news is that there’s more to all of this than just a label of post-traumatic stress and the debilitating symptoms that go with it. We have the hope of post-traumatic growth. The idea that even in the midst of destruction and devastation the human spirit can arise stronger, more connected and forever better gives us the motivation to rebuild our emotional houses too. It’s hard work but worth every bead of sweat it takes. 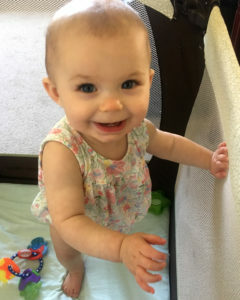 Our 11-month-old daughter is now walking and those days on the 12th floor seem like yesterday and forever ago all at the same time. Are we the same one year after Hurricane Harvey? No, and we never will be but maybe that’s OK. Beautifully stated! We all carry some type of pains from our past. It’s not that we have the pain, it how we carry it and what type vessel we use as we go forward.